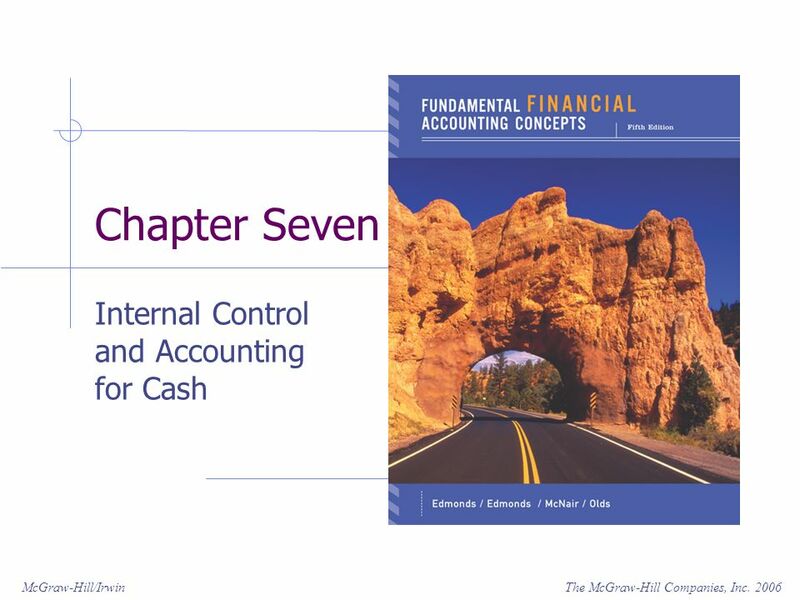 The McGraw-Hill Companies, Inc. 2006McGraw-Hill/Irwin Chapter Seven Internal Control and Accounting for Cash. 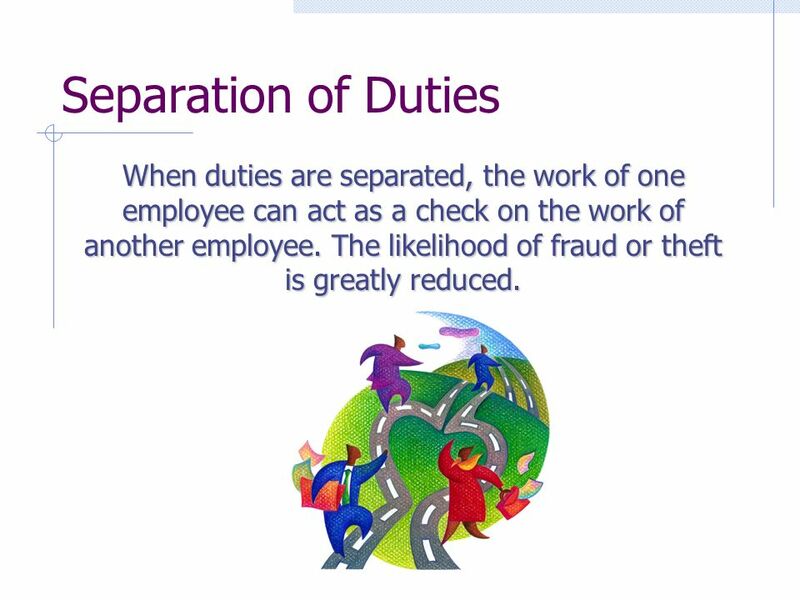 3 Separation of Duties When duties are separated, the work of one employee can act as a check on the work of another employee. The likelihood of fraud or theft is greatly reduced. 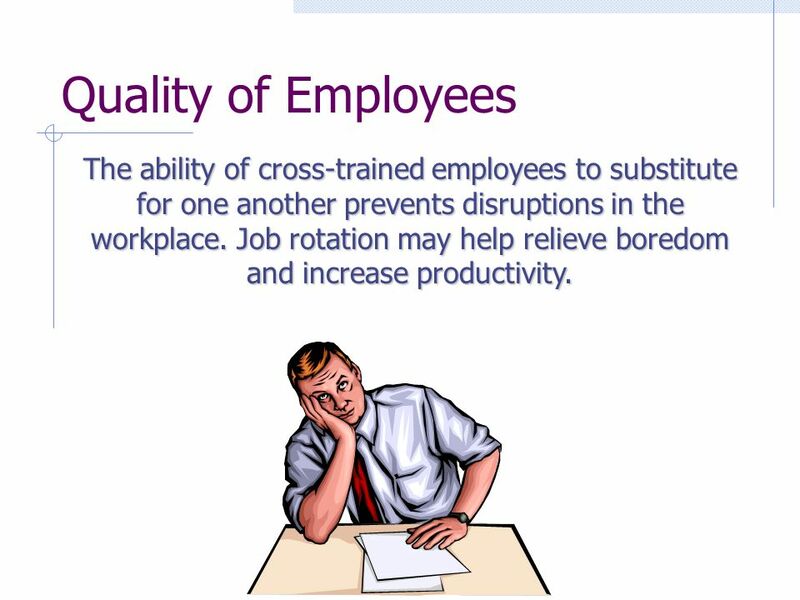 4 Quality of Employees The ability of cross-trained employees to substitute for one another prevents disruptions in the workplace. Job rotation may help relieve boredom and increase productivity. 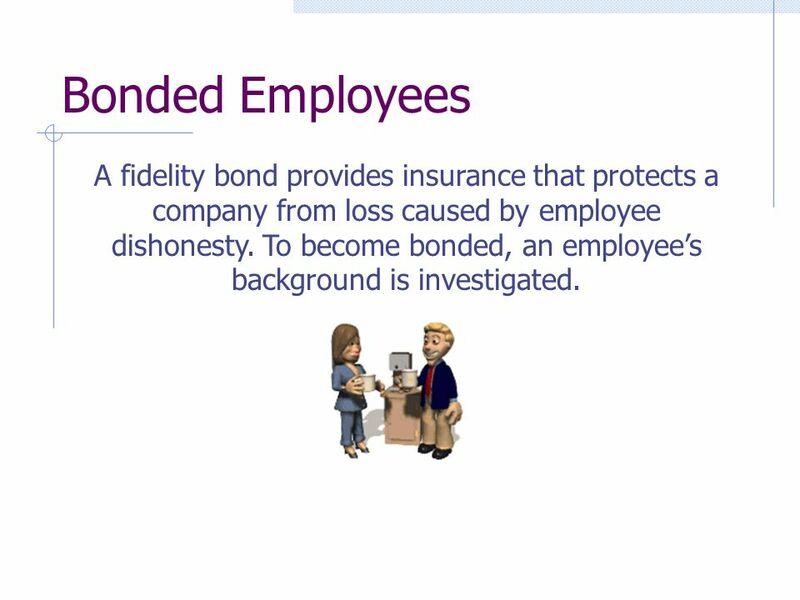 5 Bonded Employees A fidelity bond provides insurance that protects a company from loss caused by employee dishonesty. To become bonded, an employees background is investigated. 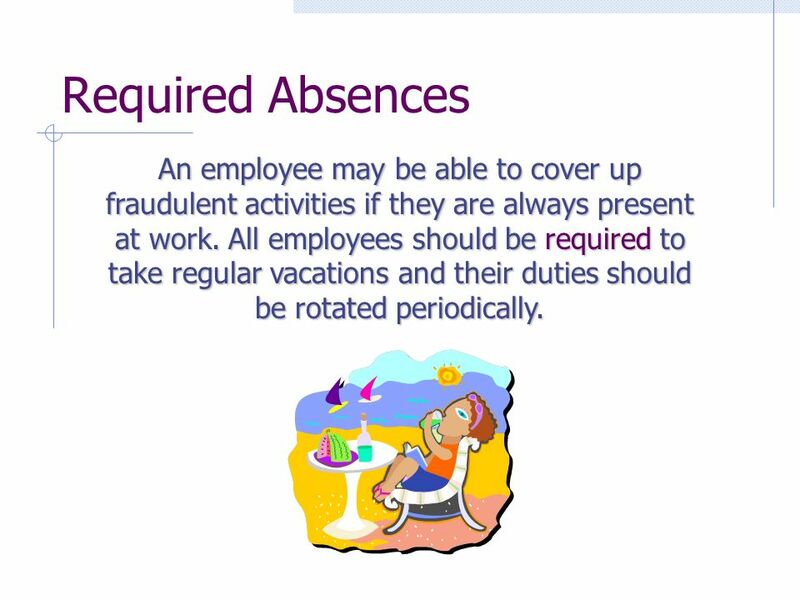 6 Required Absences An employee may be able to cover up fraudulent activities if they are always present at work. All employees should be required to take regular vacations and their duties should be rotated periodically. 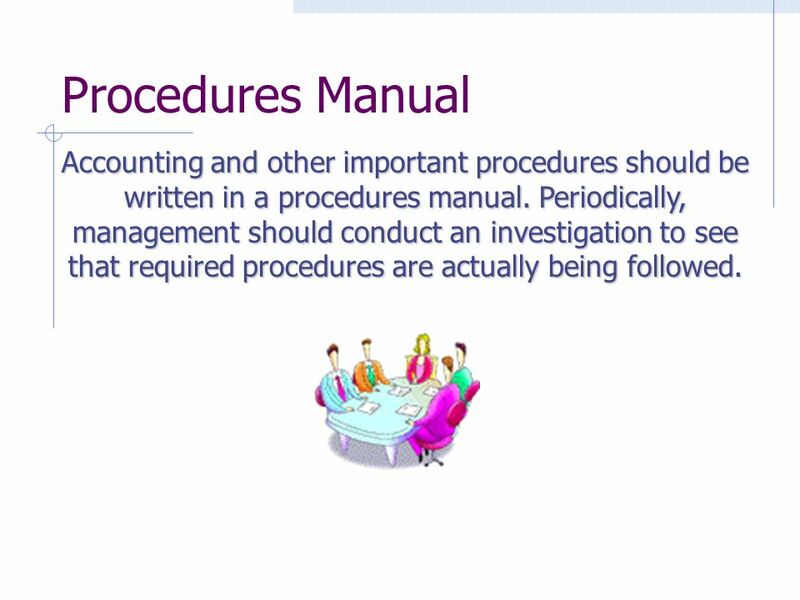 7 Procedures Manual Accounting and other important procedures should be written in a procedures manual. Periodically, management should conduct an investigation to see that required procedures are actually being followed. 8 Authority and Responsibility General authority applies to all member of the organization. 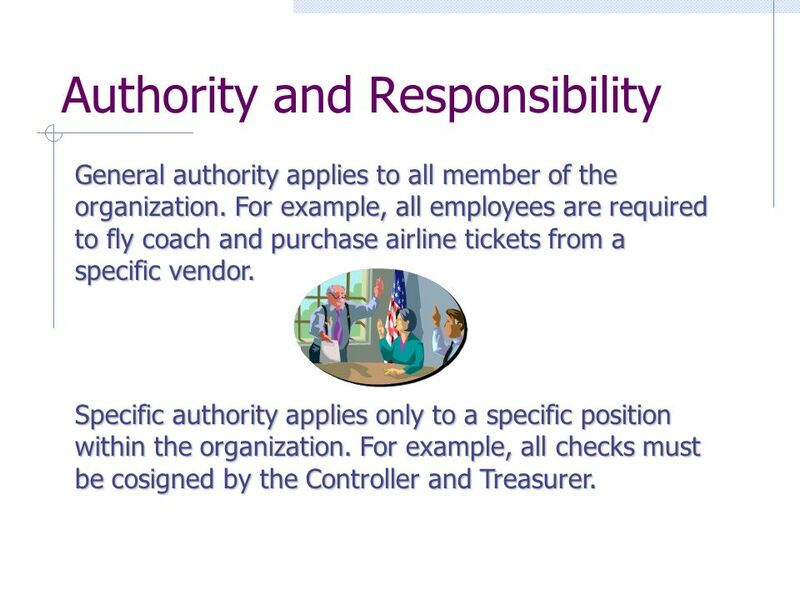 For example, all employees are required to fly coach and purchase airline tickets from a specific vendor. Specific authority applies only to a specific position within the organization. For example, all checks must be cosigned by the Controller and Treasurer. 9 Prenumbered Documents. 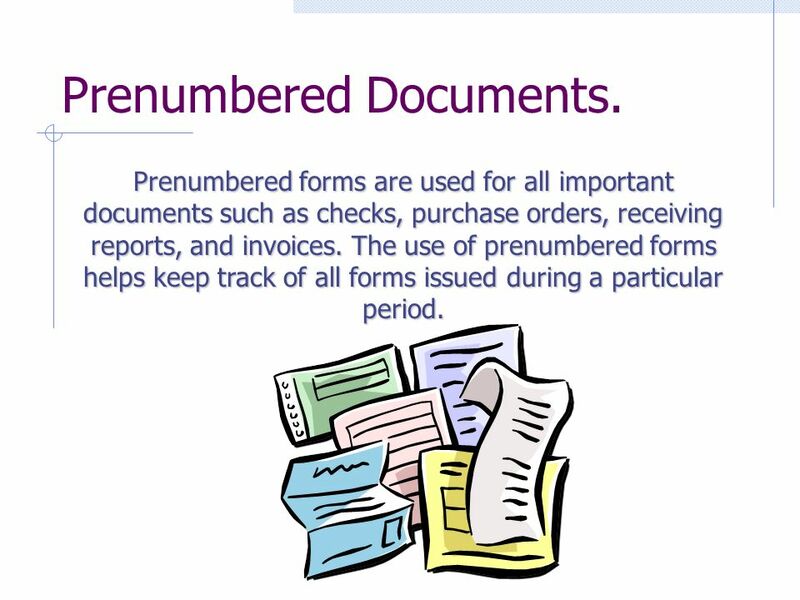 Prenumbered forms are used for all important documents such as checks, purchase orders, receiving reports, and invoices. The use of prenumbered forms helps keep track of all forms issued during a particular period. 10 Physical Control All companies should maintain adequate physical control over valuable assets that may be misappropriated. For example, inventory should be properly stored in a secure location. Serial numbers should be placed on all valuable assets to assist in a physical count of these assets. 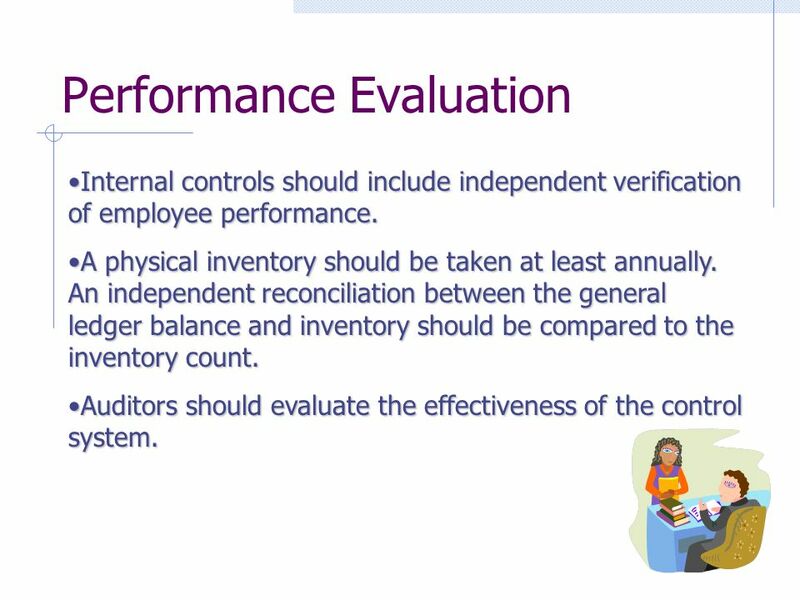 11 Performance Evaluation Internal controls should include independent verification of employee performance.Internal controls should include independent verification of employee performance. A physical inventory should be taken at least annually. An independent reconciliation between the general ledger balance and inventory should be compared to the inventory count.A physical inventory should be taken at least annually. An independent reconciliation between the general ledger balance and inventory should be compared to the inventory count. Auditors should evaluate the effectiveness of the control system.Auditors should evaluate the effectiveness of the control system. 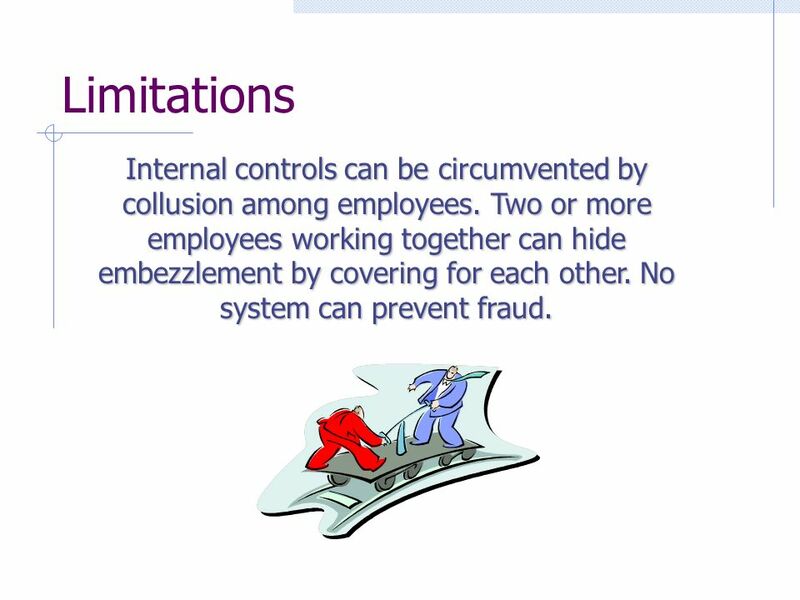 12 Limitations Internal controls can be circumvented by collusion among employees. Two or more employees working together can hide embezzlement by covering for each other. No system can prevent fraud. 13 Accounting for Cash Controlling Cash Cash receipts should be recorded immediately upon receipt and deposited intact daily. 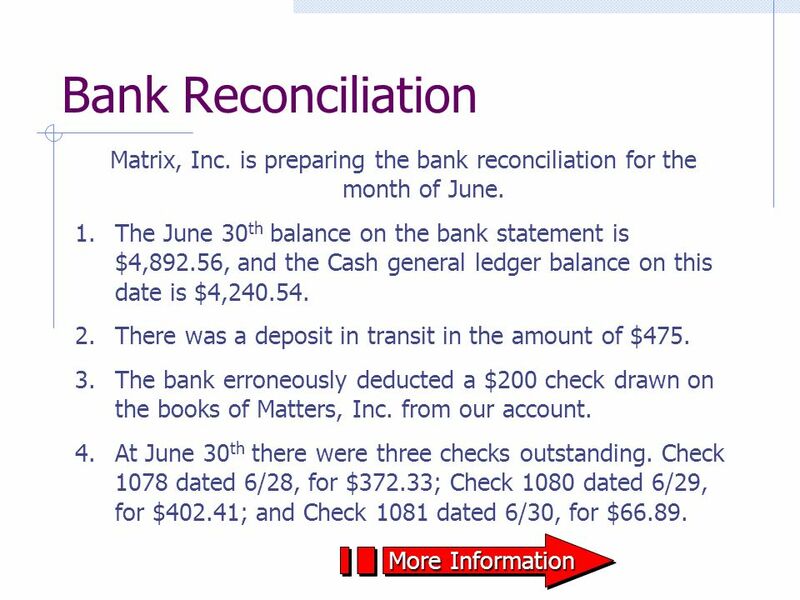 Cash disbursements should be made by prenumbered check. Up to date signature card should be maintained. A deposit ticket should be used for all deposits. 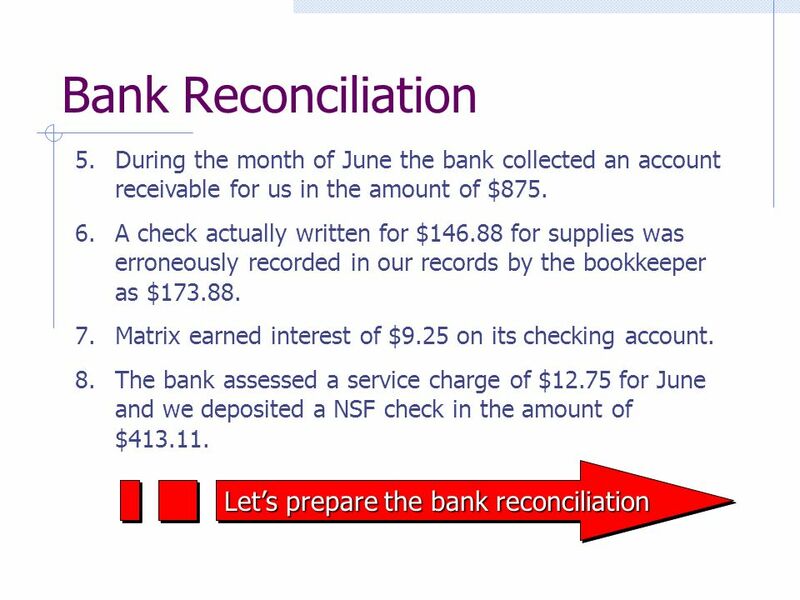 A monthly bank reconciliation should be prepared by an independent party. 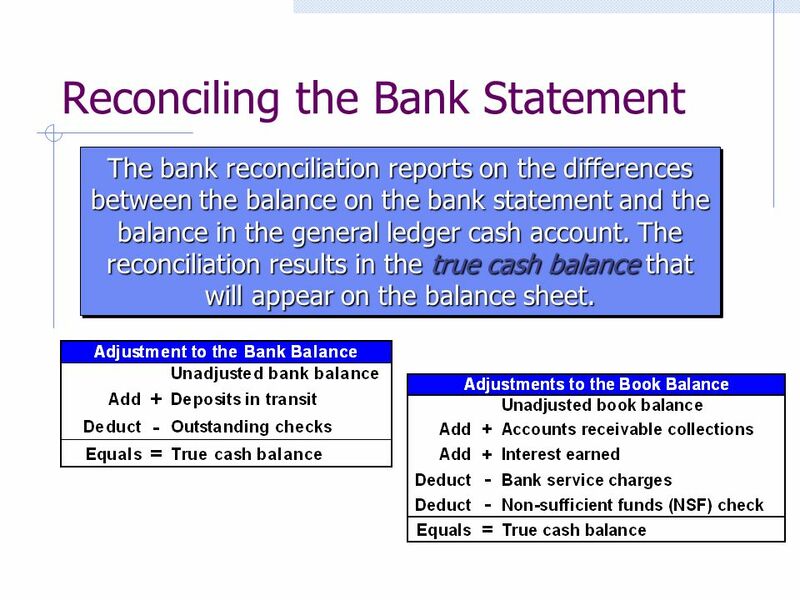 14 Reconciling the Bank Statement The bank reconciliation reports on the differences between the balance on the bank statement and the balance in the general ledger cash account. 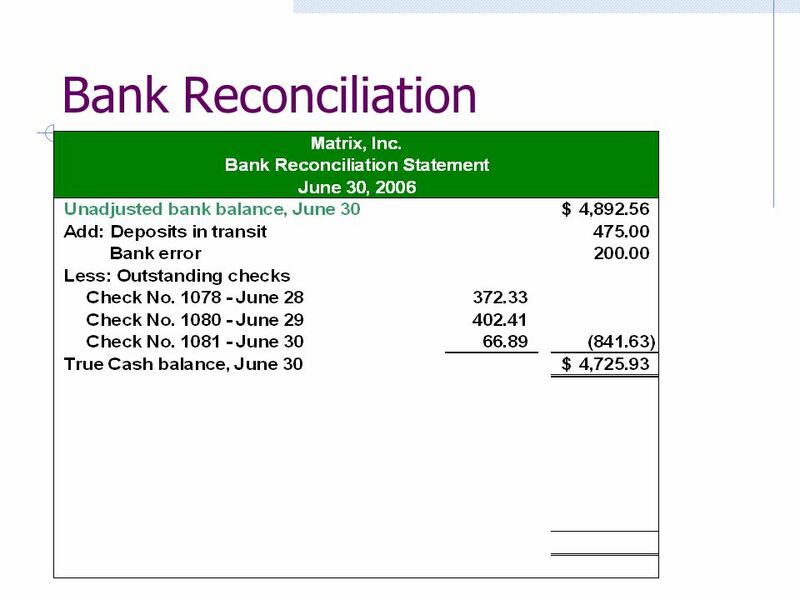 The reconciliation results in the true cash balance that will appear on the balance sheet. 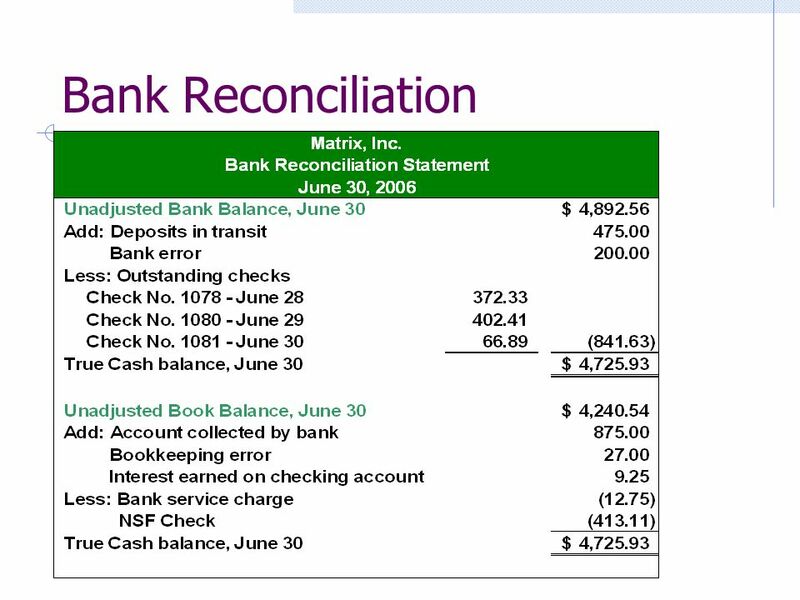 15 Reconciling the Bank Statement If an error is found on the bank statement, an adjustment for it is made to the unadjusted bank balance to determine the true cash balance. 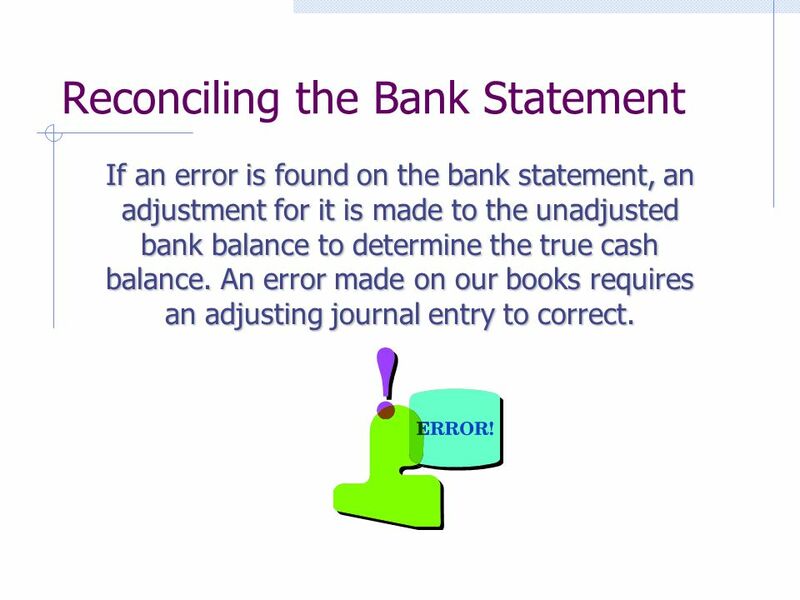 An error made on our books requires an adjusting journal entry to correct. 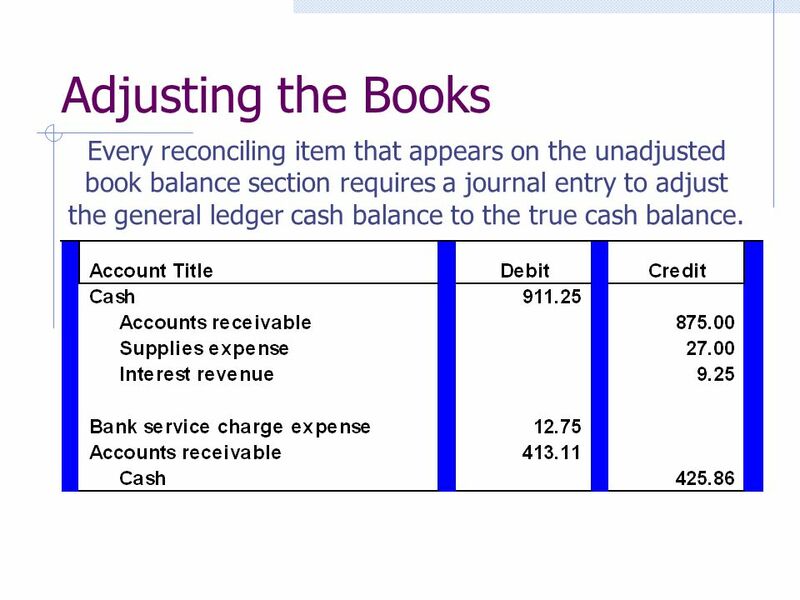 24 Adjusting the Books Every reconciling item that appears on the unadjusted book balance section requires a journal entry to adjust the general ledger cash balance to the true cash balance. 25 Cash Short and Over When using a cash register, employees sometimes make mistakes in collecting cash or making change for customers. 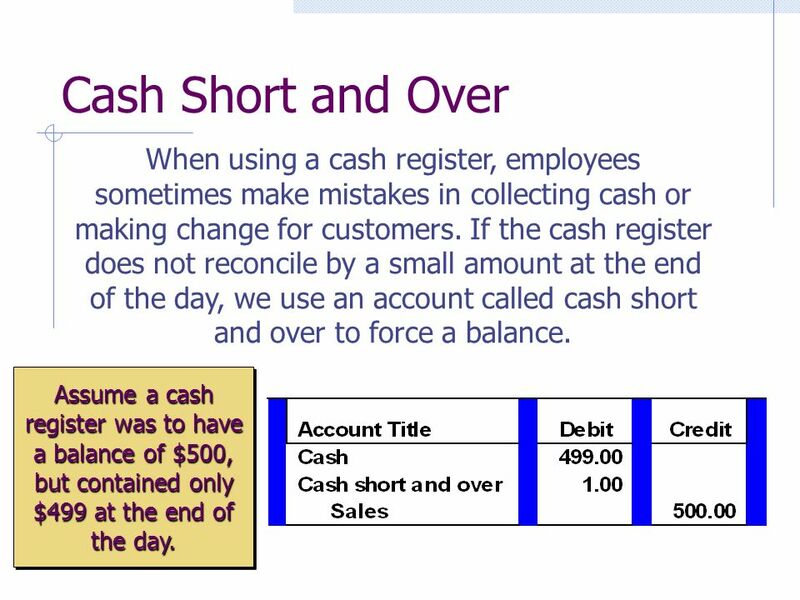 If the cash register does not reconcile by a small amount at the end of the day, we use an account called cash short and over to force a balance. Assume a cash register was to have a balance of $500, but contained only $499 at the end of the day. 26 Using Petty Cash Funds A petty cash fund is used to make small expenditures that cannot wait for the formal check- writing process. The fund is operated on an imprest basis. This means that when the fund gets low on cash it is replenished. 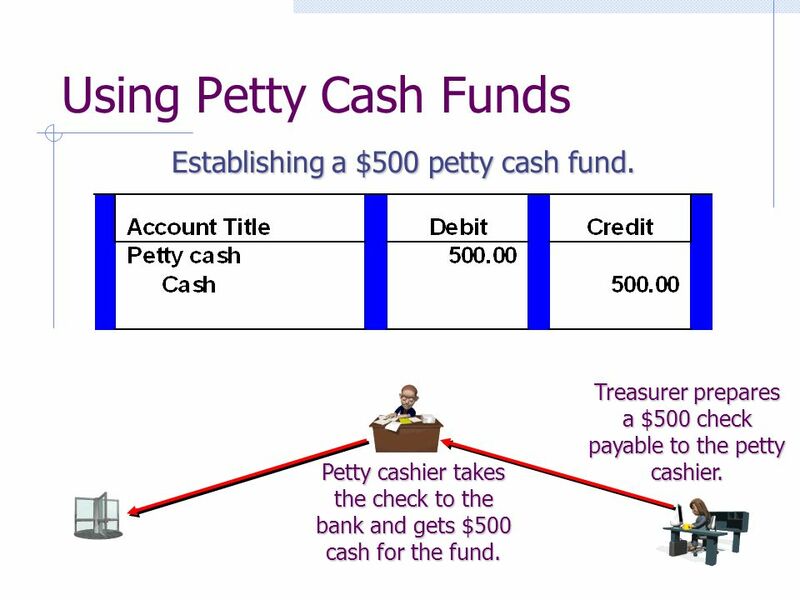 The petty cashier is always responsible for the cash in the fund. This is an excellent internal control. 27 Using Petty Cash Funds Establishing a $500 petty cash fund. Treasurer prepares a $500 check payable to the petty cashier. Petty cashier takes the check to the bank and gets $500 cash for the fund. 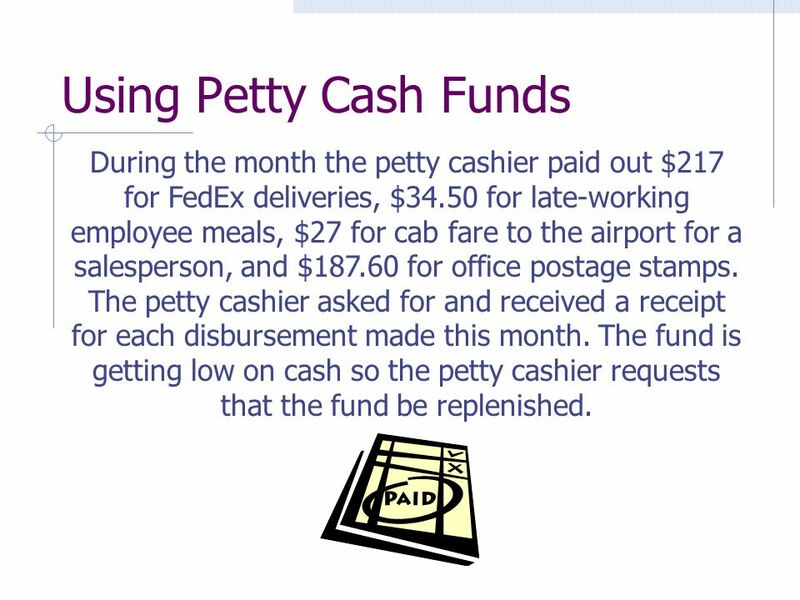 28 Using Petty Cash Funds During the month the petty cashier paid out $217 for FedEx deliveries, $34.50 for late-working employee meals, $27 for cab fare to the airport for a salesperson, and $187.60 for office postage stamps. The petty cashier asked for and received a receipt for each disbursement made this month. 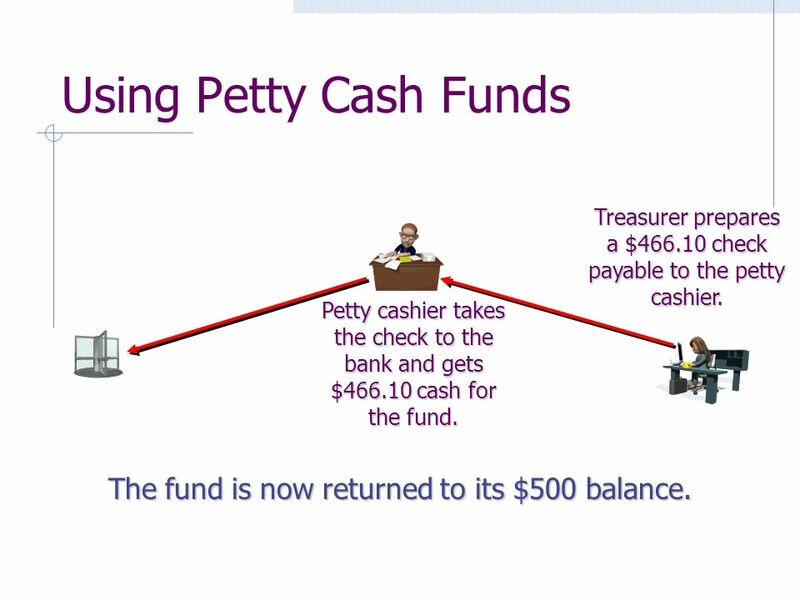 The fund is getting low on cash so the petty cashier requests that the fund be replenished. 30 Using Petty Cash Funds Treasurer prepares a $466.10 check payable to the petty cashier. 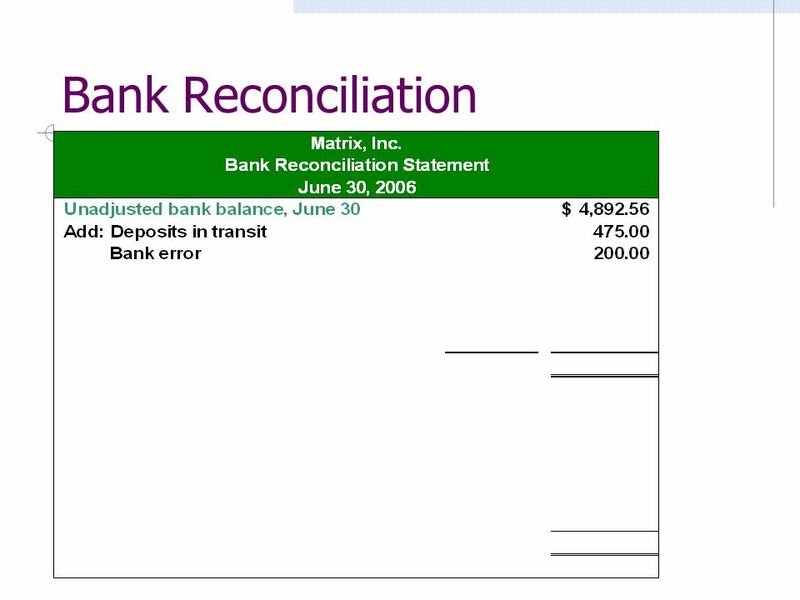 Petty cashier takes the check to the bank and gets $466.10 cash for the fund. The fund is now returned to its $500 balance. 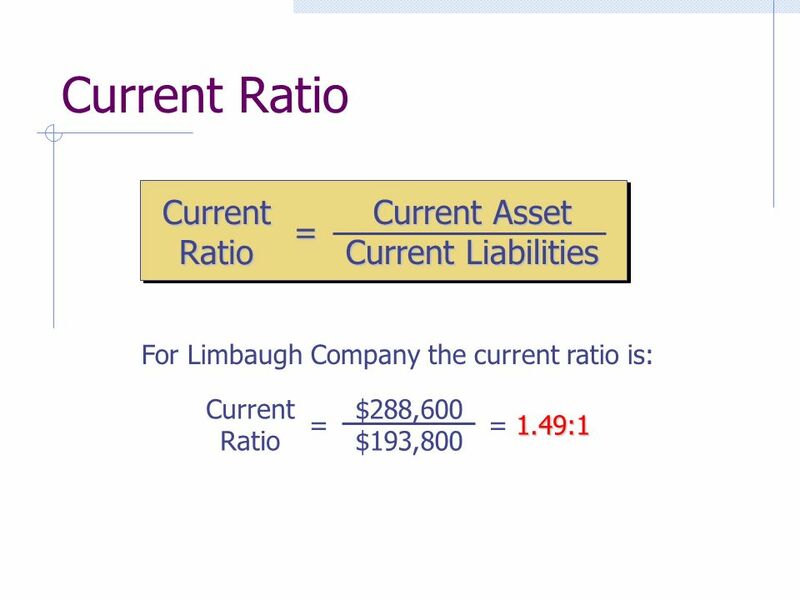 Download ppt "The McGraw-Hill Companies, Inc. 2006McGraw-Hill/Irwin Chapter Seven Internal Control and Accounting for Cash." 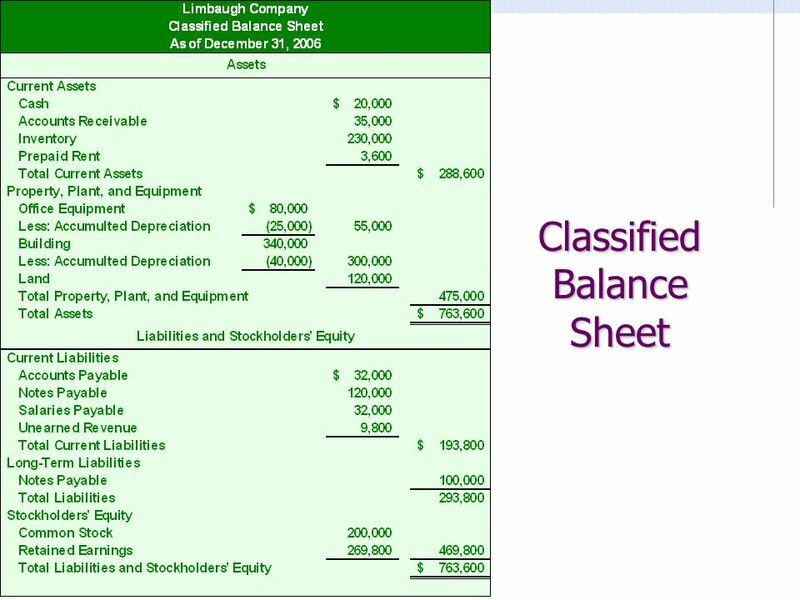 © The McGraw-Hill Companies, Inc., 2002 Slide 9-1 McGraw-Hill/Irwin 9 Internal Control and Cash. McGraw-Hill/Irwin Copyright © 2009 by The McGraw-Hill Companies, Inc. All rights reserved. 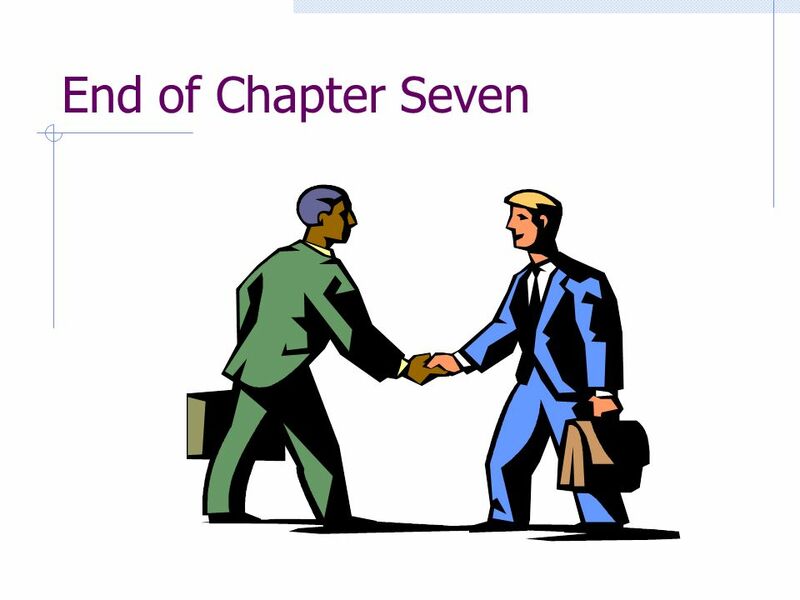 Chapter 2 Business Processes and Accounting Information. C6 - 1 Learning Objectives Power Notes 1.Basic Accounting Systems 2.Internal Control 3.Controls Over Cash 4.Internal Control of Cash Receipts 5.Internal. Identify the key elements of a strong system of internal control. 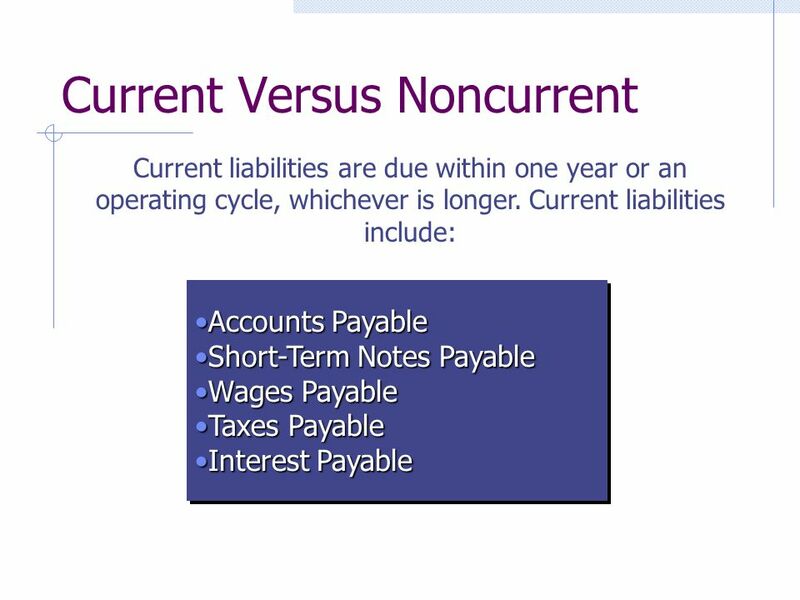 CHAPTER 8 INTERNAL CONTROL AND CASH After studying this chapter, you should be able to: 1 Define internal control. 2 Identify the principles of internal. 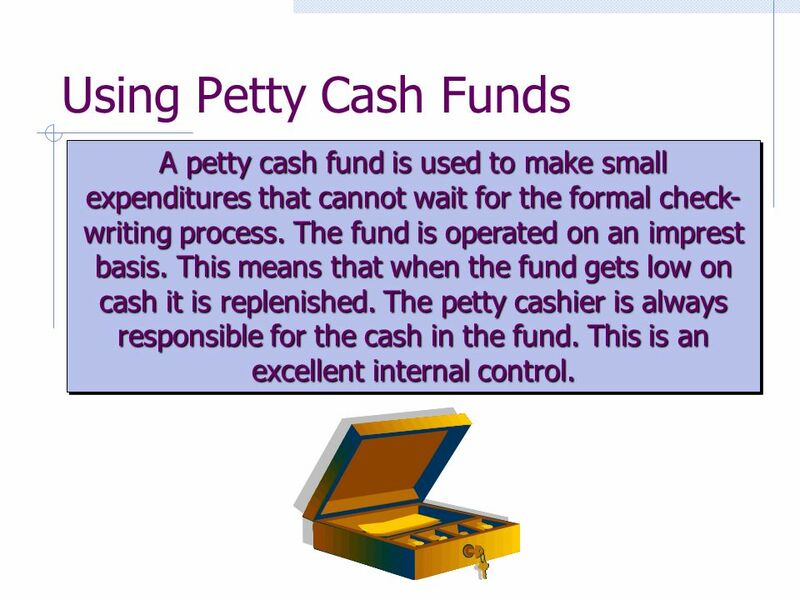 INTERNAL CONTROL AND CASH STUDY OBJECTIVES After studying this chapter, you should understand: Definition of internal controlPetty Cash Principles of internal. 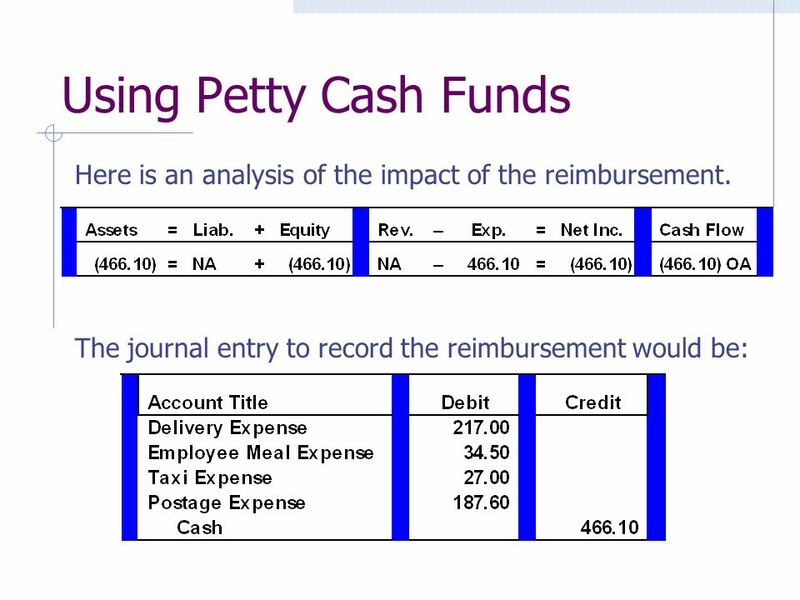 Internal Control and Accounting for Cash Chapter Six McGraw-Hill/Irwin Copyright © 2013 by The McGraw-Hill Companies, Inc. All rights reserved. 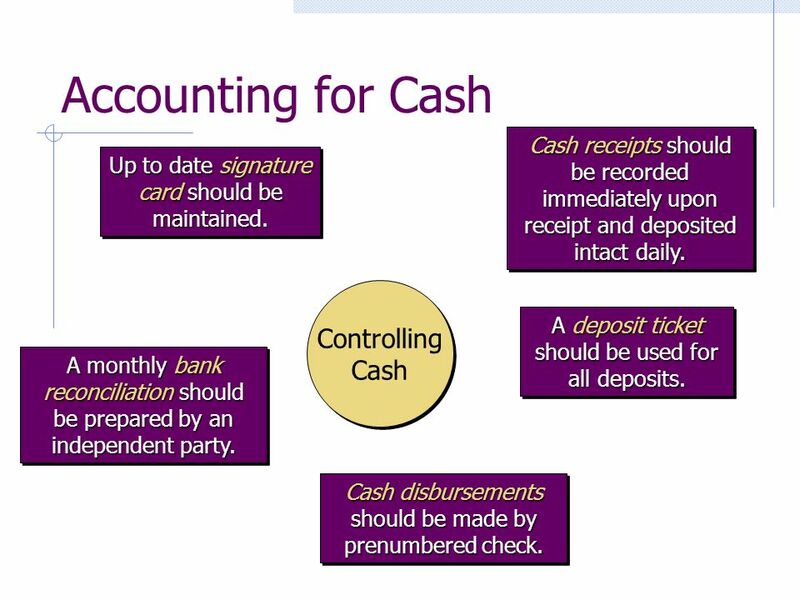 C7 - 1 Learning Objectives 1.Cash and Cash Controls 2.Internal Control of Cash Receipts 3.Internal Control of Cash Payments 4.Bank Accounts: A Cash Control. 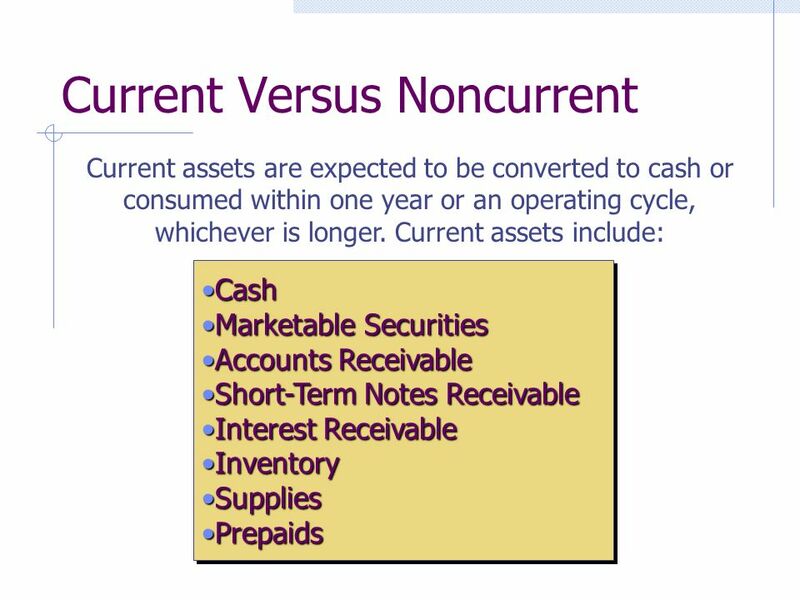 ACCT 100 Chapter 7 Internal Control and Cash Internal Control and Managing Cash 2 Objectives of the Chapter 1. Introduce the internal control to safeguard. Copyright © 2007 Prentice-Hall. All rights reserved 1 Internal Control & Cash Chapter 8. CA$H and Internal Controls. Internal Control consists of... all the related methods and measures adopted within a business to: –safeguard its assets Employee.